Zahra was a young woman in her mid-thirties when she came to Canada with her mother, sister and brother in 2007. Zahra's family are Muslim, originally from Afghanistan but spent the 16 years prior to immigrating to Canada in Iran. They came to Canada for a new life, hope for a brighter future. They were very poor in Afghanistan and Iran. There was little opportunity, especially for women. 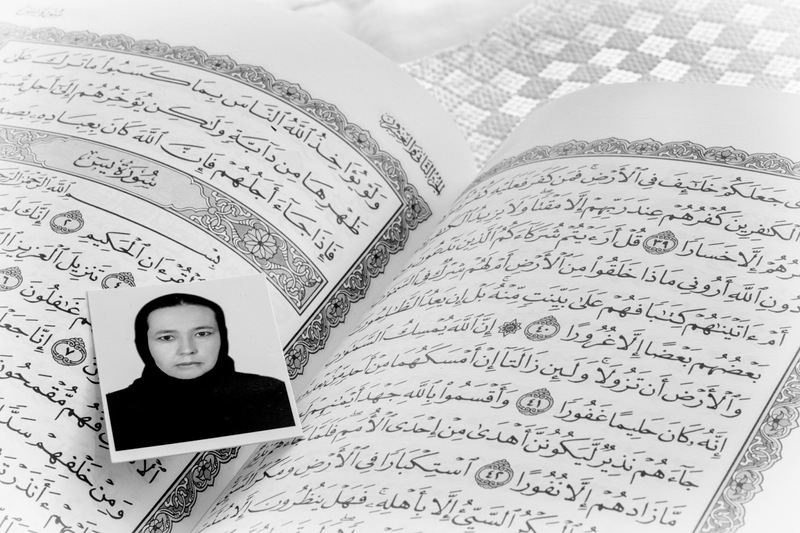 Here is a photo of Zahra (her family's favourite one of her) laid against the pages of the Koran, the book of Zahra's Muslim religion and the book that Zahra read and prayed with daily. The family was just beginning to find their feet when Zahra was diagnosed with Stage IV cancer. She began aggressive chemotherapy. This is where this writer comes in. I met Zahra and her sister Salimeh in the cancer treatment centre waiting room in early 2009. We struck up a conversation. The two barely spoke English but were both smiling and had such agreeable dispositions. I was drawn to them but I cannot say why. We learned that Zahra and I shared the same Oncologist. We also learned that we were both on long term treatment regimens. Coincidently, our quarterly scans fell pretty close together with Zahra a month or so ahead of me. We also often shared the same treatment day. I felt close to Zahra and Salimeh. November 2009 came and it was a rare occasion where Salimeh was not by Zahra's side. Zahra asked me in her broken English how much a funeral cost here? I told her I didn't know. I said the cost probably varies a lot depending on whether you are cremated or not. If not, you'd need to buy a casket and I hear those are expensive. She said that in her religion, there is no cremation or casket, you are simply laid in the ground and buried. I had never heard of this. I told her I didn't know. Zahra then said she was tired and was ready to die. She said she prayed everyday to die but is still alive. I told her then it was probably not her time to go. She said she was thinking of stopping treatment, it made her tired and she wanted to die. She looked tired but at the same time, at peace. I told her that I was not ready to die, that I am going to keep fighting. One of our names was called to go into the treatment room. We said goodbye and we both knew it was forever. I thought of Zahra so many times over the next year. I looked for her in the treatment room. I didn't really know how to spell her name so couldn't check the obituaries. I believed Zahra was gone. Fall 2010 arrives and one day, as I am leaving the treatment room, who do I run into in the waiting room? Zahra and Salimeh! I must of looked at Zahra as though I'd seen a ghost because she looked at me as though she'd seen a ghost. We hugged and cried. Salimeh was crying. There were hugs and tears all around. I told her I thought she'd died. She laughed and said she thought I'd died. We giggled like school girls. At that point I realized the waiting room was full, and all eyes were on us. What were other people thinking I wondered? Here we were laughing about each of us thinking the other were dead. It made me think of 'a joke' that long term cancer patients often say to one another when they haven't crossed paths in awhile. You say, 'You still here?!' It's always funny because the phrase has double meaning - one is, 'you are still in treatment?! ', the other is - 'you're still alive?!'. It's only funny if you are a long term cancer patient though. We hugged and said goodbye. This time I thought I'd see her again. She hadn't changed a bit. I didn't see Zahra after then and later I came to learn that in November of 2011, Zahra had died. I was overwhelmed by emotion. Even though in 2009 Zahra herself told me she was ready to die, prayed to die, and I knew in my heart she was at peace, I felt so sad for her sister, her mother and her brother. They came to Canada with such hopes and dreams for a new life but instead faced sickness and death. I remember when I first met Zahra, she was in English school but soon dropped out when her sickness made her unable to carry on. Hopes dashed, a young woman's life snuffed out. I was overcome with grief - for the future Zahra would not have, for her sister who was by her side every step of the way, for her mother who had lost her husband only a few years before and now a child, and for her brother, a young man in a new country trying to find his way. It was as though a cloud of darkness had settled over me. Stay tuned for our upcoming post, 'Coping with Grief'. Support Cancer Crossing by PayPal! P.O. Box 70029, 1-1660 Kenaston Blvd. We are an entirely volunteer run organization. If we are slow to get back to you, that is the reason! Publish 'Cancer Crossing', a compilation of stories of cancer patients and caregivers accompanied by touching black and white photographs. Net proceeds from book sales go to cancer patient support services. Support will begin in Manitoba where the project has originated and as proceeds increase, will fan out across Canada. We also plan on continued printing of the book, so ultimately, the book may be gifted to newly diagnosed cancer patients as a companion on their journey. A collection of stories about life, through the eyes of cancer patients and caregivers. Their unique experiences lead you, the reader, on a journey of self discovery. 'Cancer Crossing', a patient companion book and fundraiser, for cancer patient services across Canada.